Argon gas is typically used for TIG/GWAW welding of aluminium and stainless steel. It is now also widely used in the manufacture of sealed double glazed window units. Ryval gas Pure Argon is amongst the highest specification on the market with a purity level of 99.998% and supplied with an industry standard valve. With 2 litres of gas, which could give almost an hour of weld time*, Ryval’s “EXTRA SMALL” package is the equivalent of almost 9 disposable canisters so represents great value for money. 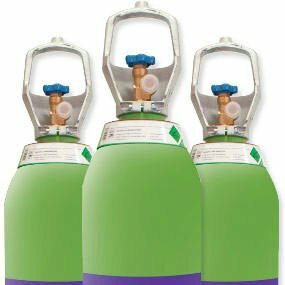 Our Argon gas cylinders are completely RENT FREE. Standard valve outlet - BS No.3: 5/8" BSP RH INT Valve. 2L cylinder perfect for hobbyists and small businesses. 10L cylinder for professional welders. Gap filling in double-glazed windows. Purging and blanketing related to the production, processing and fabrication of metals. Argon is heavier than air and can collect in ditches. As an asphyxiant and toxic in high concentrations, it must be used in well-ventilated areas. Check detail on the MSDS. When MIG/GMAW welding ferrous materials, pure argon is not an ideal shielding gas, as it produces an arc with poor cathodic rooting characteristics, large droplet size and therefore higher levels of spatter. For this reason, Ryval recommends that Mig Shield gases be used.